Burial of her cremated remains will be in Hamden Plains Cemetery. Ann B. Ward, 90, of Woodbridge, entered eternal rest on November 18, 2018. She was the widow of Everett G. Ward. Mrs. Ward was born in Ansonia, CT on February 5, 1928, a daughter of the late Benjamin W. Bostic and Daisy Byrd Bostic. 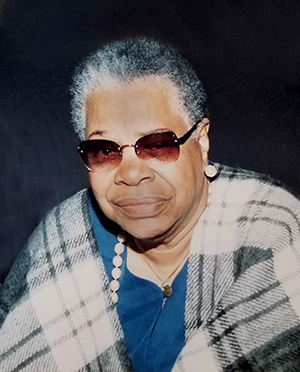 She was employed for numerous years by Easter Seals Goodwill as a Social Worker and was a longtime parishioner of St. Luke’s Episcopal Church. She leaves to cherish loving memories, daughters, Laura Fort and Angelica Ward; a son, Howard Mayo; brother, Edward Bostic; grandchildren, Daryl and Robin Fort; and a host of nieces, nephews, other relatives and friends. She was preceded in death by her stepmother, Gussie Tillman Bostic; brothers, Owen, Grover, Roosevelt and Joseph Bostic; and sisters, Bessie and Janelle Bostic and Thelma Webb. A memorial service to celebrate Mrs. Ward’s life and legacy will be held Monday, November 26, 2018, at 11:00 a.m. at St. Luke’s Episcopal Church, 111 Whalley Ave., New Haven. Burial of her cremated remains will be in Hamden Plains Cemetery. In lieu of flowers, memorial contributions may be made to the St. Luke’s Episcopal Church General Fund, 111 Whalley Ave., New Haven, CT 06511. May your many memories of Ann help to sustain you at this difficult time. Carol Suber, New Haven, Conn.
May you feel nourished by the memories of this precious and unique human being. It’s is said “Like vapor we rise and then we’re no more” and so it is. We give thanks for her life and contribution. With grace, love and peace may she rest!